I’ve been traveling solo for more than six years now. While not every trip is on my own, many of my journeys begin by stepping onto a plane with just my bag and a flexible itinerary of where to go and what to do. And though I start off solo, I’ve found that I’m never really alone—unless I want to be. 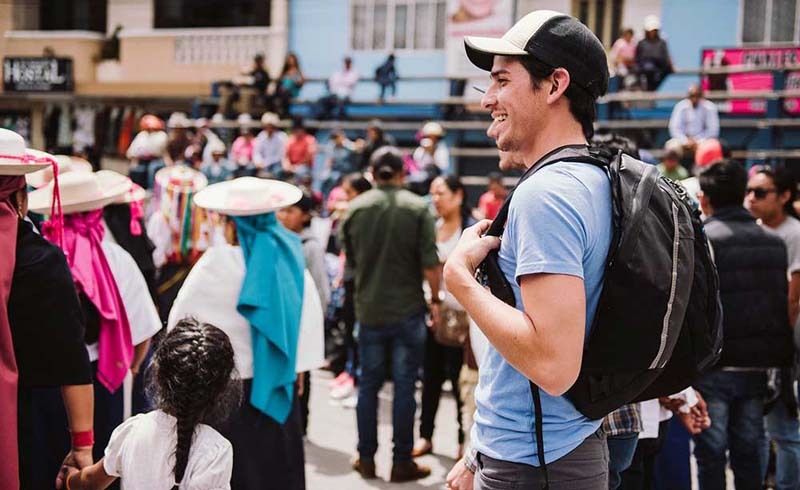 Meeting locals is one of the best parts of traveling and going alone doesn’t mean that you have to hole up in your hostel and not venture out. In fact, it’s the perfect opportunity to fully immerse yourself in local culture—your new local friends will know the best off-the-grid spots to eat and explore. And beyond the travel tips, meeting people from the area can help expand your worldview and create meaningful friendships, lifelong or fleeting, with people you never would have met otherwise. So while it may take a bit more effort to meet locals on a solo trip (it can be nerve-wracking for more introverted folks), it’s well worth the effort. To help you along, here are some sure-fire places and activities that can make it an easier endeavor. Skip the hostel and rent a room. Staying in a hostel is a popular option for solo travelers. They’re less expensive than hotels and are full of plenty of interesting characters. However, you don’t often meet locals in a hostel, because the people who work and live there tend to be visitors, too. A better option? Rent a room. Sites like Airbnb.com and Couchsurfing.com allow you to save money on lodging and meet people who actually live in the city that you’re visiting. Hosts on these sites are not only invaluable sources of information, but they’re also interested in meeting new people, too. When you’re visiting a foreign country, language can be a barrier for forming new friendships with locals. Kill two birds with one stone and look for learning opportunities while traveling. For instance, when I visited Cali, Colombia, I found an "international night" at a salsa club. It was designed as a language exchange, so I got practice my (albeit horrible) Spanish to friendly locals who, in turn, wanted to polish their English. After an hour or so of conversation, the music started and salsa became the international language of the evening. Many cities offer free walking tours. Sign up for one of these short excursions and not only will you meet other travelers, but your local guide can also be a great source of information. On a recent walking tour in Barcelona, my guide pointed out several restaurants and bars that were off the regular tourist path. We ended up meeting up later and I got to know him and his girlfriend, as well as several other local friends. Sites like Meetup.com detail various events in an area and are designed to help facilitate new friendships based on common interests. Couchsurfing.com has a list of destination-specific “meet and greets,” for example. Facebook is another great resource: When I book a trip, I’ll often ask my friends if they have friends there. I was able to spend my first night in Cape Town with friends of friends who were not only great resources, but also fun to hang out with. If you have mutual friends, then there’s an excellent chance that you’ll get along, too. These are just a few of the places where you can meet locals when traveling solo. As with any situation, though, it’s important to use common sense. Don’t go off alone with a stranger, be aware of those around you, and make sure that you’ve told someone of your plans. The world is full of wonderful people who are just as interested in meeting new friends and learning about other cultures as you are. So strike out on your own—there are no strangers, just buddies you haven’t met yet. What about you? When you travel solo, what are some ways that you make friends with locals? Discover out more ways to learn more about yourself and other cultures through travel when you Find Your Unknown.